A2600 Pitfall II: Lost Caverns (USA) "maximum score" in 09:39.43 by solarplex. 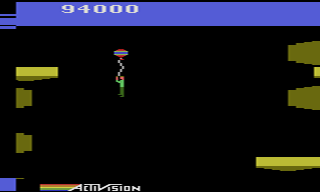 Pitfall II: Lost Caverns is a platforming video game originally released for the Atari 2600 in 1984. The sequel to the popular Pitfall!, it opens up the world into a free-roaming adventure instead of progressing on a linear path. This run is different from the any% TAS in that it does everything necessary to achieve the maximum score. This means avoiding falling down pits (which decreases your score by 100 each time) and following a much longer route in order to obtain all items. This route allows the author to show off a glitch that spawns a balloon earlier than intended, which is used an additional time in this run to save 4.40 seconds over the previous run.